In between the answers YES and NO we can find the place of NOT YET – but only if we are wise enough to look. 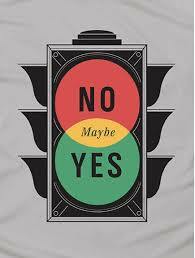 If you are like me, you typically think of YES and NO as absolute. It either is or it’s not…there’s not a lot of wiggle room. But what if there were more wiggle room, more possibilities? What if, in between being told “yes” and “no” there is a place of preparation and self-management? That’s the value of NOT YET. Here’s how my eyes were opened to that lesson. I was working toward an important professional certification and thought I was prepared. Imagine my response when I was told I had failed an important part of the exam. I was blindsided! My first response was to run headlong into NO. NO – I wasn’t going to get the coveted prize. The realization took the wind out of my sails. I was angry, embarrassed and determined to believe the worst of the credentialing system. After all, it told me I was a failure. You see, I was taking up residency in the land of NO. In the midst of my angst, I was fortunate to be surrounded by people who believed in me. They brought me into the energy of NOT YET. In fact, husband Paul had to come in and get me – yank me out of the energy of failure – out of NO – to bring me up and out to NOT YET. When I made the move into NOT YET, it became clear that seeing the possibility of a positive outcome in the end doesn’t mean the path will be easy. In fact, the opposite is often more true. Getting from NO to YES takes courage, hard work and a willingness to accept how we are seen by others – not just how we see ourselves. 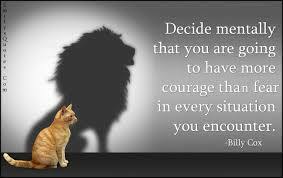 When I mustered the courage to live in NOT YET, I discovered a sense of urgency and determination. It was a place of hard work and hope. What’s the lesson here? I think it’s two-fold. The personal lesson is to look for NOT YET when I hear NO. We have to be wise enough to understand that some NOs are absolute – people die, positions are filled with someone else, seasons end. But if I look, I might find the NOT YET. Sometimes it is clearly in front of me; sometimes it’s on another playing field. The point is to look. 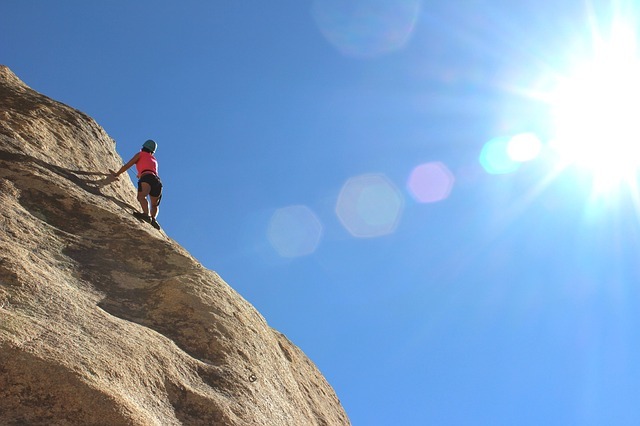 Once possibility of NOT YET is discovered, it’s important to remember that the journey will probably be challenging. The land of NOT YET is aspirational – and it’s not for wimps. The second lesson is a leadership lesson. When someone around you – or someone you are responsible for – gets a NO, help them find their NOT YET. You can help them see what is beyond, what is possible when they’ve just gotten a NO. When I was blind to possibilities, others gave me the gift of vision. We are called on to deliver NO’s as leaders (coaches, parents, teachers). The lesson is to remember NOT YET. When we practice looking for the path to YES, we teach others to, as well. YES is not always automatic. Sometimes it can take a lot of NO’s to get to YES. Looking for the NOT YET offers hope and the whole world of possibilities! One of the great myths in coaching/leadership is that being wrong is a sign of weakness. That couldn’t be further from the truth. The challenge is, in a world where competition is so powerful, it’s almost natural to see things strictly through the lenses of win or lose; strength or weakness. If that were the only option, it would follow that if I’m wrong, I’m weak. Pretty harsh, so let’s not buy into it yet. Let’s look at a story of how being wrong led to success. Gary Patterson, head coach at TCU, used to have a deliberate approach to running an offense. It worked well for years. In fact, TCU made it to the Rose Bowl in 2011 and won. That win paved the way a couple of years later for TCU to make the leap to the Big 12 to play with the big boys. Coach P’s deliberate approach to offense that had worked so well in the past was a disaster in the new era. The team went 2-7 in their conference debut. What had been right in the past became really wrong. Let’s pause the story for a minute and consider – if I see life as a competition, what is my response to being wrong? I’m likely to experience denial, rationalization and often disbelief (must be some mistake, I’ll just try again.) I may begin to act as though my identity, my character is tied to being wrong. It becomes personal. Think of a time when someone told you – “you’re doing it wrong.” Was your first response to be curious or was your response like mine – justify my actions, blame some outside influence and make excuses? Getting hooked by “I can’t be the one who’s wrong!” is a gargantuan waste of time and energy. GP didn’t get wrapped up in the right and wrongness. He got curious, assessed the situation, hired new fast-paced-offense coaches and handed offensive responsibility over to them – a coaching act of faith. TCU went 12 – 1 (8-1) the next year. Let’s go back to the myth: being wrong is a sign of weakness. If I worry about how I am seen, that in itself becomes the problem. I waste time focusing on looking good instead of addressing what is not working. Tip of the hat to Gary Patterson. He didn’t go there. The lesson is to choose curiosity over defensiveness and judgment. 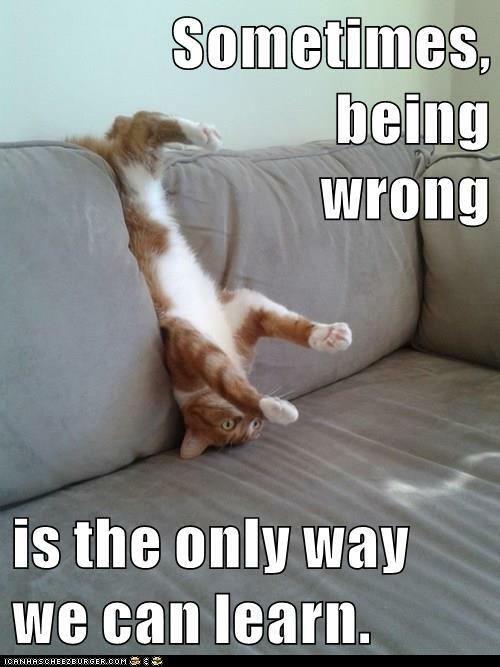 Being wrong is not a failing – it’s a failure and our job is to recover. I am sitting in my office saddened by the behavior of young athletes during this bowl season. The latest casualty of “stupid college student behavior” is a young man who had a bright future in professional sports. Perhaps he still does, but he has tarnished his reputation and could have cost his team a bowl win by his immature behavior. He certainly ended his college football career prematurely. It started in a bar – that was just the first place emotional self-control could have helped. It escalated into shoving bar employees around. It ended as friends were trying to drag the belligerent athlete back to his hotel. The police arrived and our erstwhile QB was totally out of control. He was throwing punches and one landed in the direction of a police officer. I always get a sick feeling when I think of the ways incidents like this could have been avoided. That’s the real reason I am dedicated to teaching emotional intelligence – the brain science and the social science – to young athletes and their coaches. I teach to give them a competitive advantage in their sport and to give them skills to avoid events like this. Understanding our behaviors so we can avoid emotional hijacks is critical to any success – on the football field, in the boardroom, or in a bar before an important game. Emotional intelligence happens over time, not overnight. If you want to create a team culture (sports or otherwise) that understands its triggers and can choose self-control, the time to start is now – well before the championship games, the starting gun, or the beginning of the season. It’s a great New Year’s resolution – to teach people the art and science of self-understanding and self-control. It’s our responsibility. Because when the pressure’s on, being in control is critical. I was privileged to watch a college basketball practice recently. The team is close to the beginning of their season and their practice was ragged. It happens. The energy was uneven – swinging from under-energetic to desperately urgent. I watched as the coaching staff abandoned their original practice plan to focus on the team’s concentration, stamina, and heart. These are the moments I get so glad to have the opportunity to witness. This was a time the coaches had to be nimble to meet the players where they were – to get the most out of a practice that was going a little south, diagnose underlying problems, and address them with helpful learning. It can be a tough assignment because the leaders are in the middle of their own preseason stresses. They gave me a perfect opportunity to watch for self-awareness and self-control from the coaches. 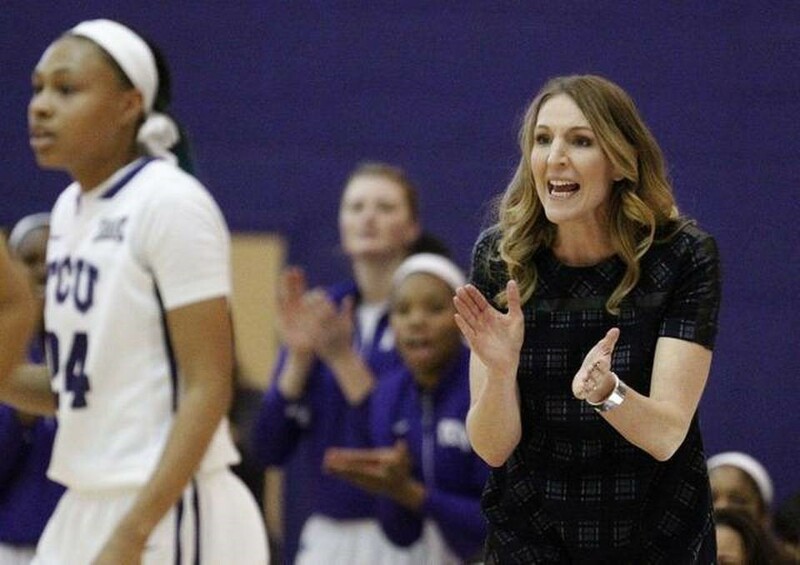 *I would like to acknowledge Coach Raegan Pebley, Women’s Basketball Head Coach, TCU, Fort Worth. Thanks for letting me watch, even when it was a challenging time. You are the type of leader people want to follow! The head coach was a rock star. She seemed disappointed in what she saw, but she never belittled the players as she pushed them to work harder. In fact, she explained to them the need for stamina and conditioning – reminded them of the challenges they would face when they began the combination of traveling, playing and going to classes. She made the purpose of the challenging practice very clear. And then she stayed. Some of the players had more running than others at the very end – it’s the cost of not thoroughly completing some of the required exercises. The coach stayed. She was hard…the point was well made. But she wasn’t harsh. She didn’t get angry, frustrated, or disgusted with the players. When the last player finished the extra rounds, she too was congratulated and encouraged – with the same sincerity given the others. Here’s the lesson. The head coach didn’t give into her own frustrations – frustrations are emotional traps that can make a leader defensive and cruel. Frustration can lead a good person to fly off the handle, insult, and bully others. This coach held the balance between the hard work that needed to be done and the humanity of her players. She was hard, but not harsh. It was elegant leadership.